House is 2.5 blocks from beach. Can see and hear waves. 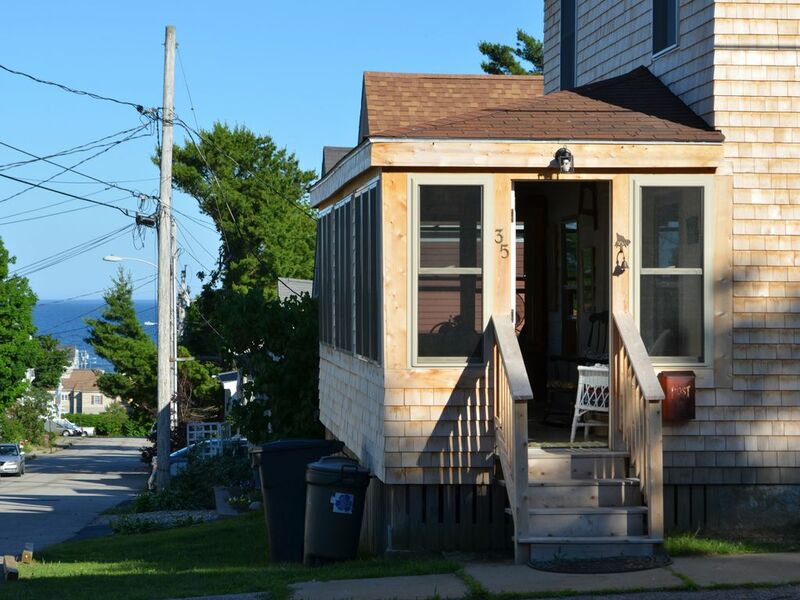 Quiet area of year-round residences - children oriented area of Old Orchard Beach. Low traffic. Address 35 Highland Ave. 5 minute walk to beach. 15 minute walk to pier. This is a very cute house. Floors are hardwood, downstairs walls are plaster. Stairs and upstairs: all ceilings and walls are wainscot. Kitchen is well equipped with gas stove and large fridge. Very short walk to beach. Downtown is just far enough so you cannot hear all the evening noise. Furniture is nice, some antiques, and not worn out. NEW 1/2 bath downstairs. Self employed professional. Lived in the house 5 years. Married and moved to Bath, ME. Great 4 bedroom house, quiet area, near beach. Small but nice grass backyard for BBQ and sitting around. Great enclosed and screened porch. Can hear and smell the ocean. Cool nights. There is also an outdoor shower with hot and cold water for rinsing off sand. Bath linens are not included. You can see the ocean from two of the upstairs bedrooms, although the trees do block it some during the summer. You can always hear the waves. 4 fulls, 1 twin, 1 sleep sofa (futon). Fenced yard, picnic table, beach chairs. There is a washer and dryer. Lots of fans. Keith and Cindy’s home on Highland was a great find for our family. The house had everything we needed for our stay, including the outside shower to wash the sand away! A very quiet neighborhood, ample room for our family and four legged friends. Short walk to downtown or Ocean Park. Nice house. No frills, but spacious and has everything you need. Good location - walking distance to beach and the pier. Enjoyed our stay. Thank for the review. Glad you enjoyed your stay. Quiet neighborhood on weekdays especially, 5 minute walk to beach, very close to Seacoast pavilion concert venue, even 1 or 2 premium channels on TV! Nice and very obliging owners. Pet friendly and kid friendly. We had a wonderful time. Thank you so much for kind words. Glad you enjoyed your stay. You are welcome back anytime!!! We had a great week and really enjoyed our stay! The front porch is very nice for coffee in the morning. The house has plenty of space for our group of 7 and we never felt cramped even when it rained. The large dining room table is great for a big group. The house is really no frills but all the appliances are newer and everything was very neat. Thank you for a great week! Thank you so much for the kind words. We love the porch for coffee as well, and of interest, I built that table from 200 year old boards I got from a barn in NW CT where I used to live. You are welcome anytime. You can’t go wrong with this property. It’s the perfect summer beach house with lots of space and all of the essentials. The location is perfect - a 5 minute walk to the beach with a cute general store and cafe (Tami Lynn’s) a block away, but it’s nice and quiet at night. It’s about 1/2 way between the pier and Ocean Park, which has some great trails and a shop that has great sandwiches and amazing cinnamon buns. You won’t find a nicer guy to rent from than Keith. He’s very laid back but also on top of keeping the place clean and fully stocked with whatever you need. Great Location- quiet and close to beach! We stayed here for a week in late August. Easy walk to less crowded area of OOB and you can still get to pier. There are plenty of fans but no AC, the outdoor porch gets really cool at night but the upstairs bedrooms can be hot. The outdoor shower and cooking area are nice and the kitchen is small but nice with good appliances. We enjoyed our stay!! Beach is 2.5 blocks. There is boardwalk and arcade. Water park, amusement park, indoor karting center, golf, fishing, boating, museums, art galleries, antiquing. 20 minutes to Portland, 35 minutes to Freeport.